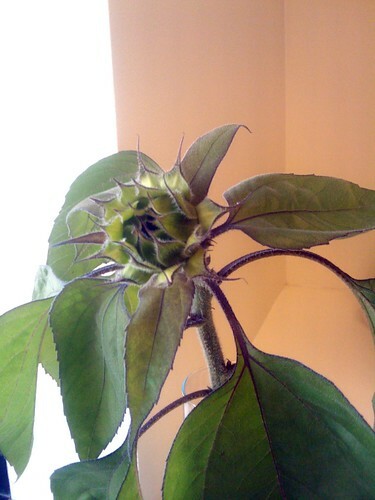 Inder Loves Folk Art: Sunflower. Rain. For the past couple of days, it has been raining pretty hard in the San Francisco Bay Area. Yeah, it's a bit early for that, but I've resolved to stop complaining about how screwed up the weather is this year and just take it as it comes (stop laughing). Anyway, early rain is great for preventing wildfires, but not so great for my garden, which was lagging two months behind gardens in sunnier climes, and was thus currently enjoying a mid-August-like splendor. Unfortunately, the heavy rain is making my tomatoes (finally! tomatoes!) split open. This is a bit sad, but if we gather them up quickly, we can still eat most of them. More tragic was the loss of some seven foot tall sunflowers! The weight of the rain (and there might have been some wind too) was too much for them. I found one of them, which still hadn't bloomed, completely collapsed and uprooted this morning. Major bummer. My cell phone camera does not do this justice. I tried to make the best of a bad situation. I lopped off six feet of stem and took the top to work with me. Where I set it in a vase and put it in front of my office window. It has already perked up a lot. What do think the chances are that it will bloom? 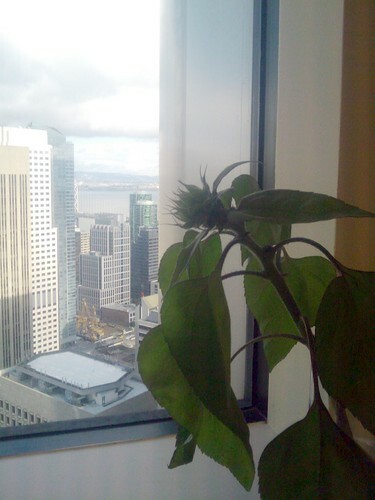 Mr. Sunflower gets a good view of Fleet Week. It would really brighten up my office if it does bloom (and I would finally get to see what color it is!). But I believe that Murphy's Law states that if it does bloom, it will be on a Saturday, when I am home with my family. Ha! Who cares if he blooms when he's so adorable and has such a great view?